We recently visited the ‘treasures’ of St Charles Hospital. 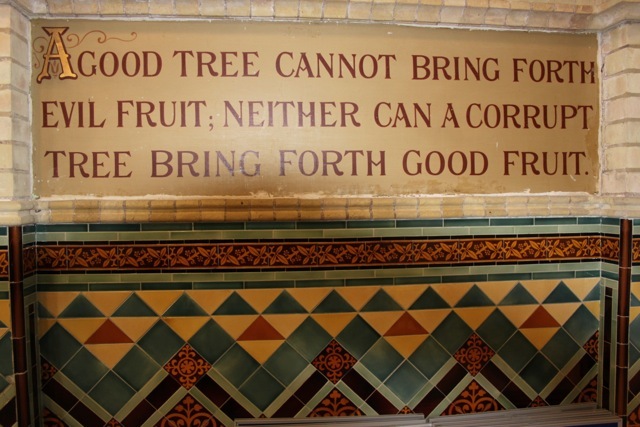 Most of us, as we go into the hospital for a routine blood test or an x-ray or perhaps to attend an activity at the Second Half Centre, are unaware that above the entrance arch is a large former chapel, decorated with colourful Victorian tiles and painted religious texts. Apparently the Nightingale nurses who trained at the Hospital in its early days as Marylebone Infirmary were required to attend every day. For many years the room was used as a store room until painters rediscovered the decoration. Originally there were stained glass windows but they were removed to put into the small chapel which was more appropriate for the Hospital’s requirements (now this is closed as well). The other interesting space we visited is the former Laundry, now the Gym on the 3rd Floor with the imposing Tower containing the water tank rising from one end. St Charles Hospital was listed – Grade II – in 1995. 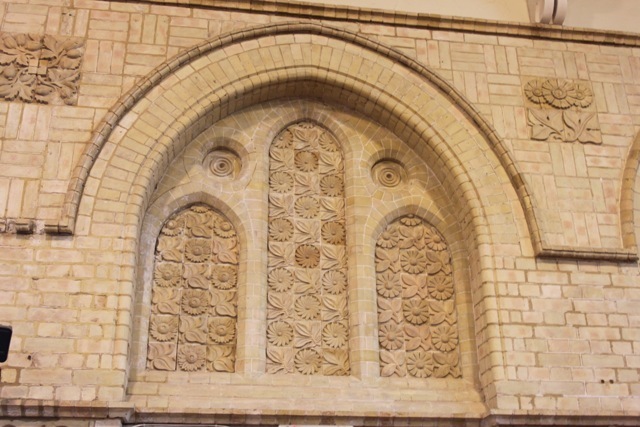 Ornate brickwork in the large chapel. Made from Sussex brick. 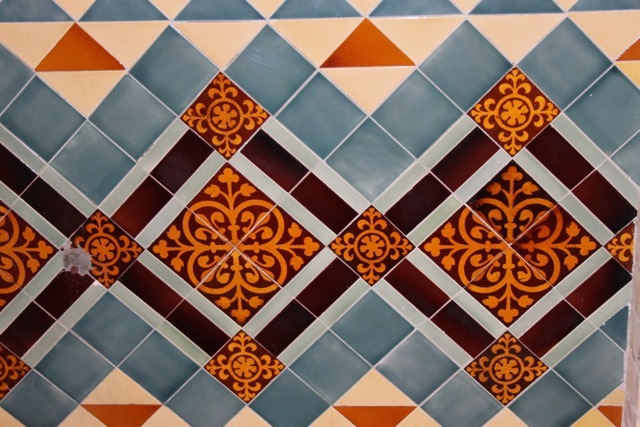 Victorian encaustic tiles on the wall of the large chapel. One of many religious texts on the walls of the large chapel. Part of a triptych in the small chapel, devoted to Saint Roche, patron saint of plagues, cholera, epidemics, relief from pestilence, skin diseases, knee problems and diseased cattle dogs. Inscription under the stained glass window. 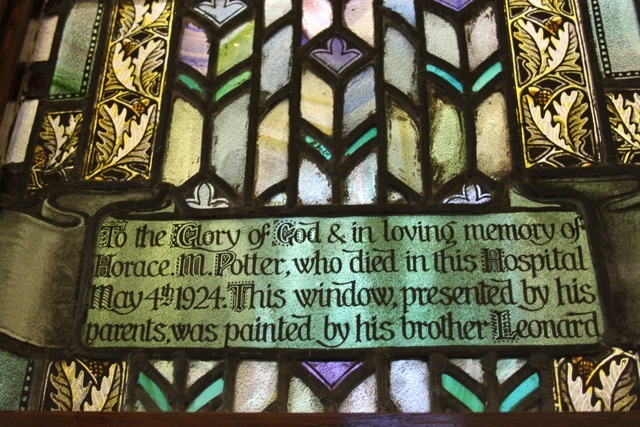 The artist Leonard Potter was an assistant to Karl Parsons, a well known Stained Glass designer. 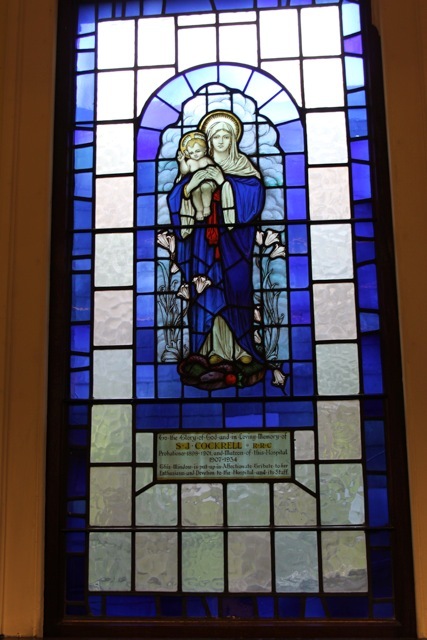 Painted glass window in the small chapel in memory of S.J.Cockrell, former matron of the hospital. 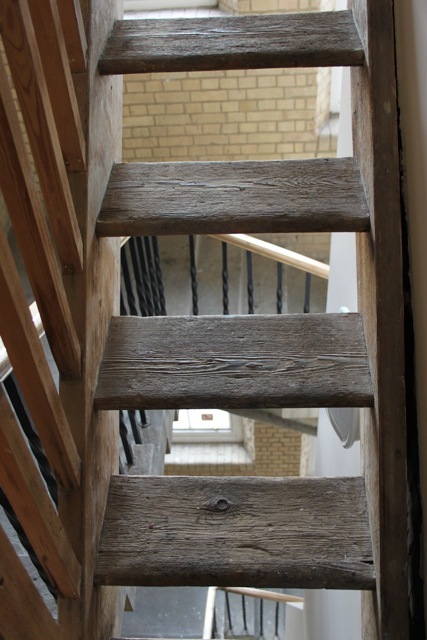 Wooden steps up leading to the water tank in the main tower. 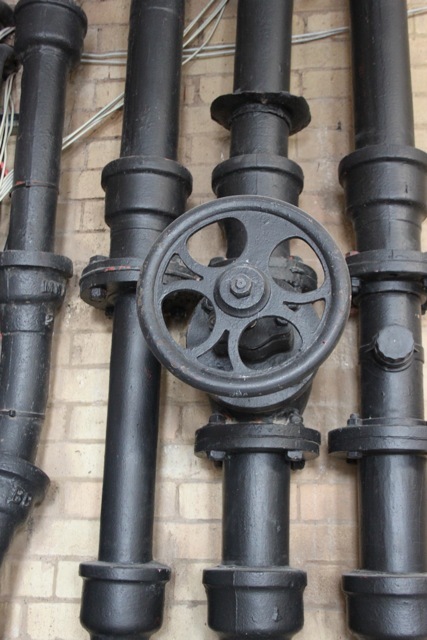 Victorian pipework and valve coming from the water tank in the main tower. 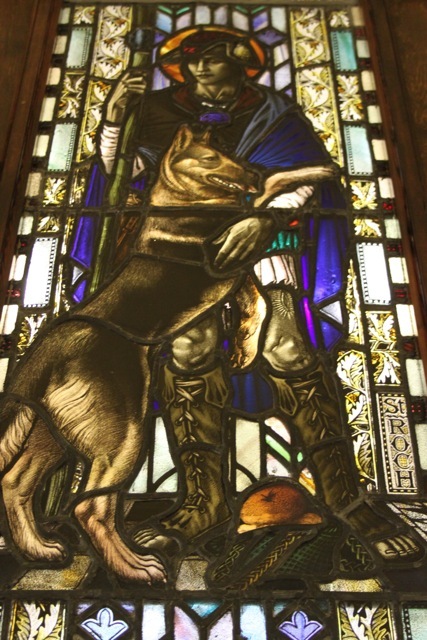 This entry was posted in Hospitals, Uncategorized and tagged chapel, Cockrell, Hospital, Infirmary, Marylebone, Potter, st charles, stained glass. Bookmark the permalink. I worked in St Charles 1957-9, mainly as a porter in the X Ray Department. Our machines were very basic by modern standards both castoffs from St Marys Paddington, the most senior in our group. One was a Phillips German machine, with the only manual in German, which baffled both Radiographers and repair workers called in. One table, used for Tomograms, had a clockwork mechanism which had to be wound back for use! I have had tours of several radiography units in my later career, and have been amazed by the facilities now, and the massive cost. The chapel over the gate was used for table tennis by staff at that time. The water tower was to provide hydraulic power for the early lifts. Only one survived by the late 50s to serve the laundry. Massive vaults ran cockroaches, which also lived under many of the cooking stoves in in the wards, which still served cooked breakfasts! Each ward had its own cleaner and ward orderly, responsible for bed and bed pan duties, and much more, which could include taking out bets for patients, to a local, as it was still illegal then. This has been wholly interesting. But for the little old man in his grey flannel trousers who might have been a bit not OK? I had always believed him as being an ex-work house man from St Charles as I was talking with him at the rear gate to St Charles. I just never bothered to query it, silly me! So thank you Dave for the correction! I shall never say that again!……promise!